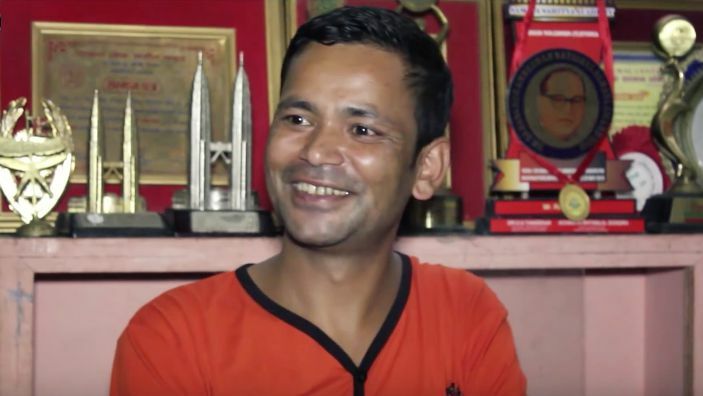 The two men share a last name but otherwise come from different worlds: Raju Parivar, a popular folk singer in Nepal, and Bishnu Parivar, a Christian pastor who runs a children’s ministry and orphanage in the tourist city of Bharatpur in the Himalayan country. They sat next to one another on a flight from Kathmandu, Nepal, to Mumbai, India, in May. During the two-and-half-hour-long trip Pastor Bishnu told the renowned singer about the God who saved him and his family 20 years ago. “I had a great passion to share the gospel, and he showed interest to listen,” Bishnu told Christianity Today by email. As he spoke to his seatmate, he imagined the impact on Nepal’s music scene if a star like Raju Pariyar came to Christ. In Nepal, only 1.4 percent of the population identify as Christian. Eight out of every ten Nepalese are Hindu, while the rest are Buddhist, Muslim, or followers of the indigenous faith Yumaism. In early July, about six weeks after the pastor and pop singer met, his prayers were answered. Raju, along with his wife and two children, made the decision to give their lives to Christ. They traveled to Bharatpur, about 150 kilometers west of Kathmandu, to make their public proclamation in Pastor Bishnu’s church. To date the 35-year-old has recorded 1100 folk songs; his singles top the charts in Nepal, and he sells out stadiums for concerts. The award-winning musician has also toured in South Asia, the Middle East, and Australia. But despite the widespread adulation, Raju faces a difficult path ahead as a Christian performer in a nation that had been a Hindu kingdom up to 2008. Last month, Nepal adopted a new constitution that establishes it as a secular country, but still requires the state to protect Hinduism. Four centuries after the first known Christian missionary in Nepal, Nepalese Christians remain a persecuted minority. According to Pastor Bishnu, Nepalese Christians regularly face discrimination. “We are hated by the people and even by the government,” he said. He asks for the support of the greater church as he begins speaking out for the faith. II Timothy 1:7-8 — For the Spirit God gave us does not make us timid, but gives us power, love and self-discipline. So do not be ashamed of the testimony about our Lord or of me his prisoner. Rather, join with me in suffering for the gospel, by the power of God. Merciful Father, your kindness caused the light of the Gospel to shine among us. Extend your mercy now, we pray to all the people of the world who do not have hope in Jesus Christ, that your salvation may be made known to them also and that all hearts would turn to you. —Lutheran Book of Worship, Prayer #191, Augsburg, 1978.